Just so you know, the links below marked * are affiliate links, which means I might earn a commission if you click and decide to buy. Of course, I never recommend products I don’t use and love. Nature Deficit Disorder is a thing, and the best way to avoid it is to get our kids outside. Spending more time outside as a family makes it easier to connect with each other and with the amazing creations God has surrounded us with. As always, parents set the example and tone for the experience, so it’s important to be positive. The point is, nature will be fun if you have fun in it. Camping is great family time. If you’re doing it right, camping means going at least partially off-grid. Seriously. Steer clear of campgrounds with wifi and go for something a little more simple. If you need electricity, I get it! The world doesn’t stop for your trip, but if you must charge your phone, try to use it sparingly. Camping with kids makes it more necessary to keep a line open to the outside world, in case of emergency, etc. However, you don’t want to negate the getaway by remaining constantly tethered to your emails, voicemails, and social media accounts. Use the extra time to look your kids in the eyes, have uninterrupted family meals, and spend time worshiping, praying, and talking together. 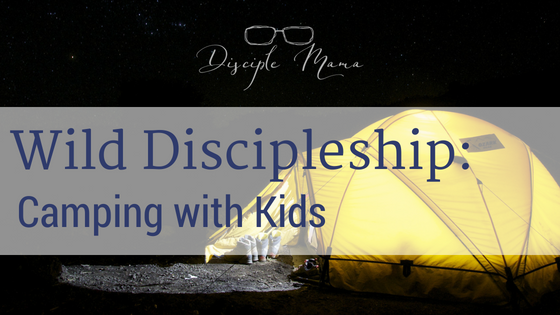 (This is a fantastic chance to work on some really focused discipleship parenting!) When that’s all been accomplished, by all means, post a family selfie so the rest of your loved ones know you’re alive. Make eco-friendly choices with your dishes. Paper and plastic dishes and cutlery are super tempting when you’re camping. First of all, no one wants to spend their time washing dishes on vacation. BUT, when you have a huge stack of paper plates and plastic cups, it’s so easy to just take another and another, and soon you have a trash bag full of the stuff and that’s only the first day. Instead, invest in one good camping plate (we use the MSR Alpine Plate *), bowl, mug, water bottle and cutlery set for each person in your family. It’s good to have an extra dish or two on hand just for serving, too. Then, set up a simple washing station (with biodegradable camping soap) and have everyone who’s old enough wash their own dishes. It’s a lot less stressful for them to learn with camping plates than with your breakable dishes at home, right? I will confess that I haven’t asked my 2.5 year old to wash his yet, but I’m thinking that on our next trip, I will show him how. He does put his own dishes into the “sink” (it’s a plastic dish bucket), though. Obviously there will still be some general washing for you (or your spouse) to do. Just take courage in knowing that if the kiddos can wash their plates now, they’ll be able to wash frying pans soon. Part of the beauty of camping is that the kids can play all day with minimal toys. There’s really not a lot (other than meal-related stuff) to clean up each day when you’re outdoors. But, what trash does end up on the ground is really easy to spot in a natural setting. It’s a perfect chance to talk to your kids about litter and taking time to leave a place better than you found it. If your kids can walk, they can help with this responsibility! 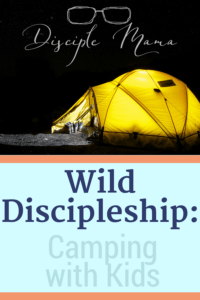 Of course there are myriads of other ways you can teach stewardship while camping. just get out there and take opportunities as they present themselves. Taking your kids camping isn’t really about denying them (or ourselves) of modern conveniences. It’s about showing them how to turn down the noise of every day living and take a few moments to solidify their connections with family and with God. Romans 1:20 tells us that we can more fully understand God’s qualities by observing nature. There really isn’t a better reason than this to get outside overnight and spend time as a family. Taking the time to immerse ourselves in creation for the purpose of connecting with each other and with the Creator is well worth the effort. 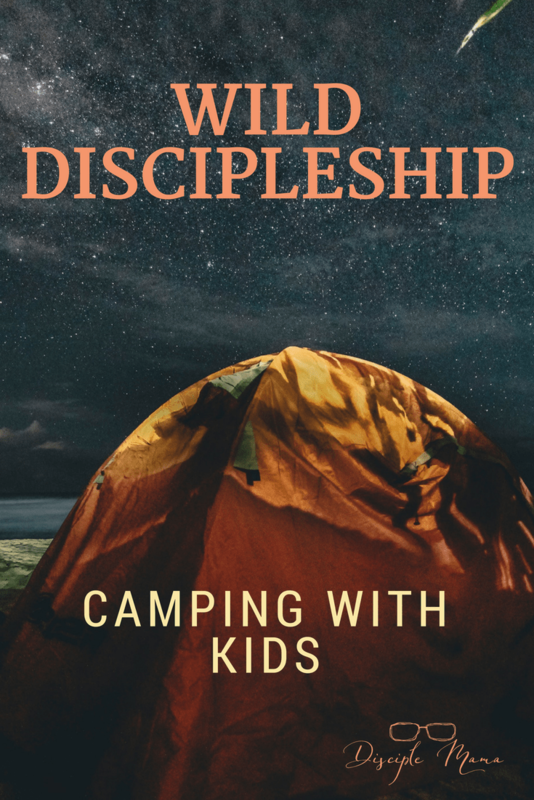 Camping with kids will give you opportunities to teach them about how amazingly God cares for His Creation. Even if you don’t know anything about plants and animals, you can still teach your children to appreciate their beauty and the wonder of seeing something they’ve never seen before. Pack up and get out there! My kids are (theoretically) asleep long before the summer sun sets here in Michigan, but when we’re out camping my husband and I like to spend time looking at the stars (and once, in the Upper Peninsula, the Aurora Borealis). Have you done that lately? Looked up at the stars and seen a glimpse of the heavens’ declaration of God’s glory? I can tell you that I haven’t done it nearly often enough. My husband and I have a summer resolution to go camping with my kids at least one more time before the season slips by. I want to really encourage you to try it! It will be a lot of work, yes, but the rewards will be well worth the effort. For more posts like this, and other great information, sign up for the Disciple Mama Newsletter! My husband just took our preschooler camping with his cousins. It was such a great experience for her! 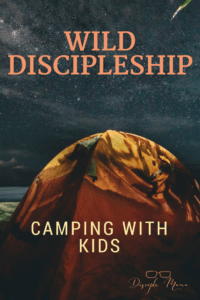 I picked up the book Last Child in the Woods and I’m excited to dive into it but I love how you connected the importance of camping not only to nature but to Christ. Pinning for reference later!